A most intriguing allegorical film about conformity, art, etc. 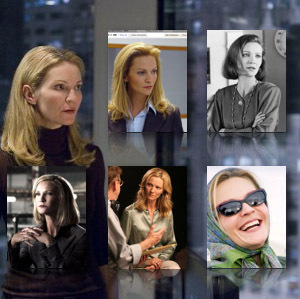 and Joan Allen is one of the core players whose transformation moves the film. She is so perfect as both the sitcom mom of the '50s and the "liberated" woman determined to meet her potential. The character also reflects the real Joan in that she grew up in a conservative, small town in Illinois and was liberated by the theatre, where, being shy, she felt she could express herself – particularly with the Steppenwolf Theatre. A longtime member of Chicago's renowned Steppenwolf Theatre Company, Allen joins fellow Wolfies Gary Sinise, Laurie Metcalfe, John Mahoney, Glenne Headly and John Malkovich as a superior and intriguing actor. Just as she uncannily channeled the First Lady Pat in the film "Nixon," Joan Allen can completely disappear in a role. Though she started off with more than her share of wife and mom roles, her classic looks and ability have moved her into self-actualized women such as the CIA tough chief in two of the "Bourne" series. Allen uses an already mesmerizing voice and adds tricks of intonations. Even when she is screaming, there is a soft tenderness about her voice. She also uses the "under your breath" trick, sometimes with a killer glare. Though her stare is usually a long-suffering sad stare. > In both movies, where Joan is talking to Matt Damon on the phone and he is watching her.